A recent eating marathon took us to Federal Hill. In an attempt to dine at as many places as possible on one trip, we sampled a grilled cheese sandwich from Grilled Cheese & Co., burgers at The Abbey Burger Bistro, and cupcakes from Midnight Confection's. (Yes, that unnecessary apostrophe annoys the heck out of me, too.) 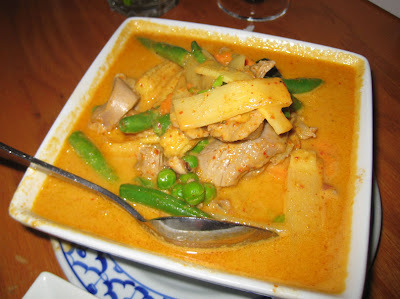 In the middle of it all, we stopped at Thai Arroy for a taste of Thai. The restaurant is cute. I loved the murals of Thai deities on the walls; they were pretty fierce. I also loved that most things on the menu came with a choice of protein. Of course we wanted everything to have duck. We tried three dishes, the som tum, or green papaya salad, fried tofu, and gang dang duck. The som tum was terrific - tangy, fishy, nutty. The two shrimp on the top had been nicely grilled, and we wished there were more. 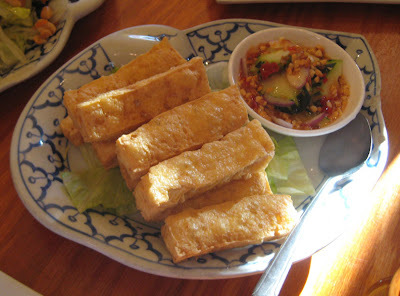 The fried tofu wasn't as crisp as that in a similar dish found at Thai Restaurant on Greenmount Avenue, but it was good, particularly with the peanutty cucumber salad/sauce on the side. At this point, we had already eaten a huge grilled cheese sammy, so I wasn't hungry anymore. Still...one more dish to go. The gang dang was aromatic, and despite the presence of coconut milk, not very sweet. In fact, it was the closest I've ever tasted to my favorite red curry from my favorite Thai restaurant, the late Bangkok Place on York Road. The chunks of duck still had some bones in them, so we had to be careful not to eat too quickly. Not a problem; as I said, by this time, our appetites were long gone. We took home most of the curry and had it for dinner a couple of nights later. Delish. 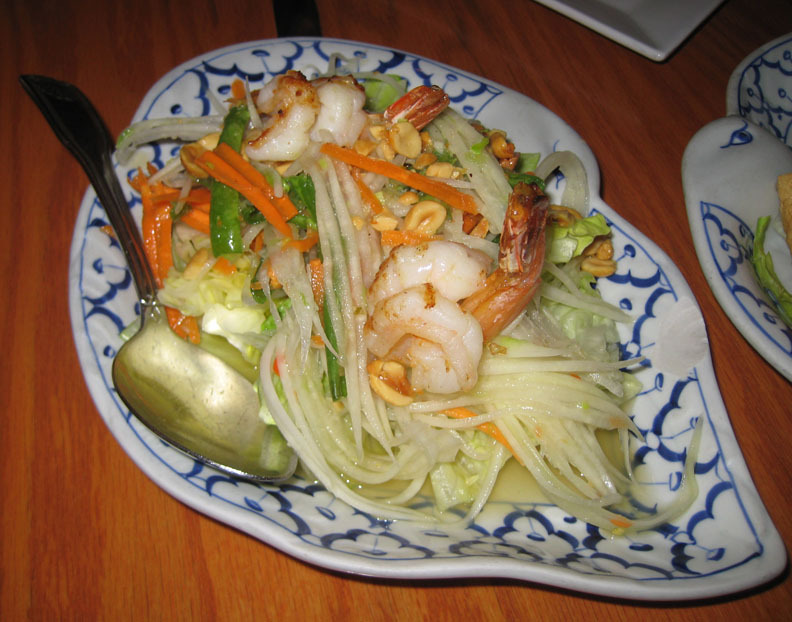 I'm glad we stopped into Thai Arroy, but it's a shame it's in Federal Hill. Traffic downtown is a nightmare anymore, so it's not like we'll stop by very often in the future. However, it's nice to know it's there, just in case.